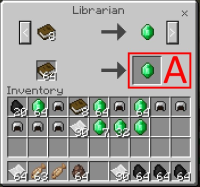 When trading you can no longer keep tapping the trade emeralds until you have used all your trade items and thus able to move multiple emeralds to your inventory at once. Now you are only allowed to trade 1 emerald at a time thus you have to move that single emerald to your inventory adding yet more tapping to play the game. If this comes back as works as intended then the intention is incorrect and is still definitely a design bug. How else will the designers find out that their mucking around of the classic UI is infuriating the classic UI users? MCPE-33830 Villager trading bug when trading your renamed item.